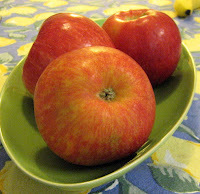 An apple a day keeps the doctor away - unless that apple happens to be laden with pesticides. Which is very likely to be the case if your apple was not raised organically. In fact, apples rank at the top of the Environmental Working Group's 2011 list of fruits and vegetables with the highest levels of pesticide residue. EWG's ranking is based on tests for contamination on 53 popular fruits and vegetables, conducted by the US Department of Agriculture and the federal Food and Drug Administration. From that data, EWG creates their annual lists of the "Dirty Dozen," fruits and vegetables with the highest levels of pesticide residue, and the "Clean 15," types of produce with the lowest levels. "If you choose 5 servings of fruits and vegetables a day from EWG's Clean 15 rather than the Dirty Dozen, you can lower the volume of pesticide you consume daily by 92 percent, according to EWG calculations. You'll also eat fewer types of pesticides. Picking 5 servings of fruits and vegetables from the 12 most contaminated would cause you to consume an average of 14 different pesticides a day. If you choose 5 servings from the 15 least contaminated fruits and vegetables, you'll consume fewer than 2 pesticides per day." That's a pretty compelling argument for buying organic and choosing clean! For more information, visit the EWG website. To print out a handy wallet-sized shopper's guide with both lists, download this PDF. Is It Possible To Get Over A Food Allergy?